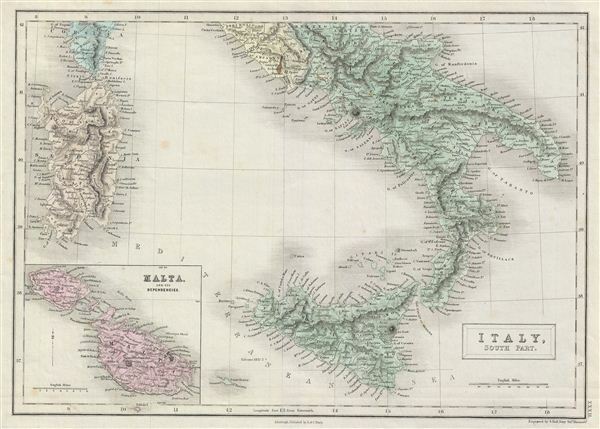 A fine example of Adam and Charles Black's 1851 map of southern Italy. The map covers the Kingdom of Naples (a common reference for the 'Kingdom of the Two Sicilies'), which extended from the Papal States south to include all of Sicily. It also shows the island of Sardinia and part of the Island of Corsica. An inset map in the lower left quadrant details Malta and its dependencies. As this map was being prepared, the peninsula was undergoing its Risorgimento, Italy's march toward national solidarity. Following the defeat of Napoleon and the merging of Sicily and Naples into the Two Sicilies, the Island of Sicily witnessed revolts against the Bourbon rule in 1820 and 1848. The final revolution in 1848 resulted in the island gaining independence from Bourbon control for 16 months. The Kingdom of Naples was the richest and largest Italian state before the Italian unification. Throughout, the map identifies various cities, towns, rivers, mountain passes and an assortment of additional topographical details. Map is hand colored in pink, green, blue and yellow pastels to define boundaries. The map is engraved by S. Hall and issued as plate no. 32 in the 1851 edition of Black's General Atlas. Rumsey 2305.037 (1854 edition). Philips (atlases) 4334.